Be the change: Unite for a better internet! Coordinated in the UK by the UK Safer Internet Centre the celebration sees hundreds of organisations unite to raise awareness of online safety issues and run events and activities right across the UK. Join the #SID2017 social media campaign and unite for a better internet! It's all kicking off on 7 February 2017! Get involved in the Safer Internet Day social media campaign by tweeting using the hashtag #SID2017 and tagging us (@UK_SIC). In January you will be able to join the Safer Internet Day Thunderclap to kick start a day of trending and everyone is encouraged to share positive messages to show their support for Safer Internet Day and to help inspire a better internet. This year we want you to give the internet a smile through our #giveasmile campaign. You can post a smiley selfie or fill in our specially designed emoji. Find out more about how to get involved. You can also join our internet safety emoji charades game. We will posting our internet safety tips through emojis and want you to join in the fun. Find out about how you can get involved in emoji charades on Safer Internet Day! Red and Murphy talk to Freddie and Alisha about watching videos online. What should children do before they watch videos on YouTube and what should they do if they see something upsetting online? This film accompanies our Safer Internet Day 2017 education pack for for 5-7 year olds. The film looks at the power of images online - how an image can create an impression and how often there is more than meets the eye in an image. How sometimes you can judge an image by seeing just a part of it and so the importance of taking in the whole, bigger, picture. Safer Internet Day 2017 - join us to celebrate the day! Safer Internet Day 2017 is on 7 February and is coordinated in the UK by us, the UK Safer Internet Centre. Join us to celebrate the day and make this the biggest yet! This film accompanies our Safer Internet Day 2017 education pack for for 5-7 year olds. #Up2Us! This Safer Internet Day I promise...to make sure none of my friends are getting bullied. For Safer Internet Day 2015, the UK Safer Internet Centre has launched #Up2Us, a film made by over 150 schoolchildren about their online experiences - both good and bad - which aims to inspire young people across the UK to do something kind online this Safer Internet Day. On 7th February 2017 we’re encouraging everyone to make the internet a better place and #giveasmile for Safer Internet Day! 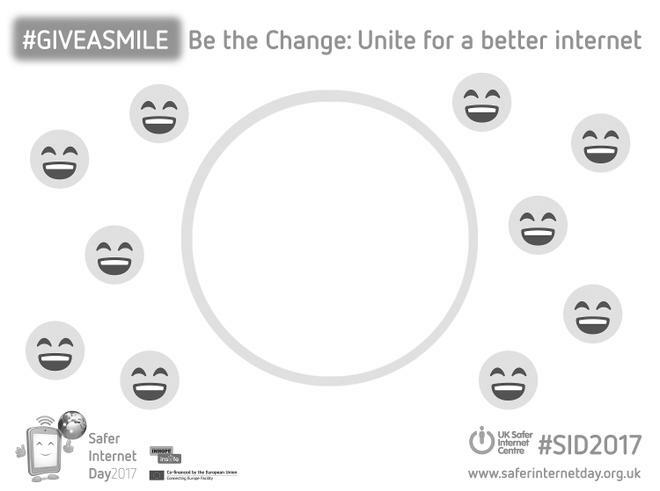 To do this we are asking schools, organisations and individuals to 'Be the Change' and help make the internet smile by posting a smiley selfie or emoji! Fill our #giveasmile template with your own message and share it on social media: We’ve created our own emoji templates which can be filled with tips and advice for creating a better internet or with positive comments. Download our emoji template here in colour or greyscale. Post a selfie of you smiling, or smiling with someone else and send it someone to make them smile! Get creative and make your own emoji out of anything you want, including objects and people! On Safer Internet Day, we called on everyone to 'share a smile' on social media and help create a wave of kindness online!